A meeting held by the Kandy Regional Office of the Human Rights Commission in support of victims of torture on June 29, 2018 raised concerns again with regard to impunity of the police, and failures of the legal system. The programme at the meeting provided an opportunity for a woman torture victim from Mahiyangana to recount her experience in a public forum. 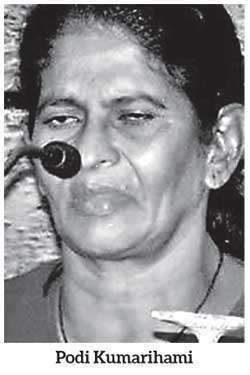 She alleged that she and her son had been tortured by officers of the Mahiyangana police. She claimed that this followed prolonged harassment from 2006 to 2017, because she refused to sell a piece of land she owned, to a senior police officer who wanted it for sand mining. "Allegations of torture by police are not uncommon. What is a matter of grave concern is the failure of successive governments to respond"
She also detailed the manner in which court procedures were abused to harass and intimidate her. She alleged that the Magistrate of the area, who is the spouse of a police officer, was responsible for this abuse of legal procedures and harassment, including arrest and prosecution. She disclosed that frequent complaints to the Police Commission, the Attorney General’s Department and the senior officers of the Badulla Police failed to elicit any response. Her case will now come before the Human Rights Commission for inquiry in November 2018. Allegations of torture by police are not uncommon. What is a matter of grave concern is the failure of successive governments to respond. The fact that this harassment is alleged to have occurred from 2006 under a previous regime, demonstrates the continuing failures in law enforcement and the phenomenon of abuse of authority with impunity. Our Constitution, and legislation from 1994, prohibit the use of torture by the State and its officials. The Supreme Court has developed jurisprudence that clarifies the responsibility of the State and the rights of citizens. There are legal provisions in an Act passed by Parliament in 1994 that demand prosecution of perpetrators. Yet the communication issued after this programme of the Human Rights office in Kandy, calls upon the government to “reactivate” the law. Does this mean that the government has adopted a policy of not enforcing the law on torture? The Friday Forum calls upon the government to clarify the current policy on this matter, and inform the public what has been done to implement earlier recommendations of the Human Rights Commission, responding to torture. We call on the government and all relevant authorities to ensure protection for the person who made these allegations at the programme organized by the HRC, pending any investigation, and afterwards too. "She alleged that the Magistrate of the area, who is the spouse of a police officer, was responsible for this abuse of legal procedures and harassment, including arrest and prosecution"
The AG’s Dept. the Police Commission and the IGP have a duty to network with each other and indicate what is being done to respond to allegations made in the Mahiyangana case. We trust that the Judicial Services Commission will inquire without delay into the allegations against the Magistrate. Professional associations like the Judicial Officers’ Association and the Bar Association have a duty to respond and engage proactively with the issue of preventing ineffective law enforcement and abuse of legal procedures, particularly in remote jurisdictions. This government’s failures in law enforcement are constantly cited as a justification for strong, effective and authoritarian governance. Yet we must also not forget the lessons of history, which reveal that failed democracy and its replacement by authoritarian governance will expose everyone, including the present rulers, to the type of experience highlighted in the Mahiyangana case. Responding to the problem is a responsibility of the State, and of all citizens who recognize the dangers inherent in abuse of power and authority. The Friday Forum is an informal and self-financed group dedicated to democracy, good governance, human rights and the rule of law. We work on a non-partisan basis and have been critical of both the Government and Opposition. Dhammapala Wijayanandana and Danesh Casie Chetty.